Grand duchy of northern Germany. It includes nine Jewish communities, among which are Delmenhorst, Jever, Oldenburg, Varel, Vechta, and Wildeshausen. The presence of Jews in Oldenburg during the Middle Ages is proved by a very old bronze seal-ring, found in the immediate neighborhood, on which are depicted two swimming frogs together with the words: "Reuben, the son of R. Jeremiah—may his memory be blessed." From a document of the knight Leborius of Bremen it appears that the Jews were expelled from Wildeshausen in 1350. Among those to whom privileges were granted by the counts of the city of Oldenburg in 1365, mention is made of the Jews (Spiker, "Ueber die Ehemahlige und Jetzige Lage der Juden in Deutschland," pp. 180 et seq., Halle, 1809). Some of the Jews of that district, mentioned by Glückel of Hameln in her memoirs (ed. Kaufmann, pp. 154 et seq. ), attended the Leipsic fair in the seventeenth century (see "Monatsschrift," 1901, pp. 473, 489). In the middle of the eighteenth century three Jewish families lived at Vechta, and were required to contribute to the war fund exacted at the time of the Seven Years' war. The Jews in Jever in 1791 instituted a patriotic festival in honor of the ruling prince, Friedrich August of Anhalt-Zerbst, and his wife, Friederike Augusta Sophia; and the cantata then sung was published (Jever, 1791). When Varel fell to Holland in 1807, the Jews of that place became Dutch subjects, whereas Oldenburg in 1811 was incorporated into the French empire. 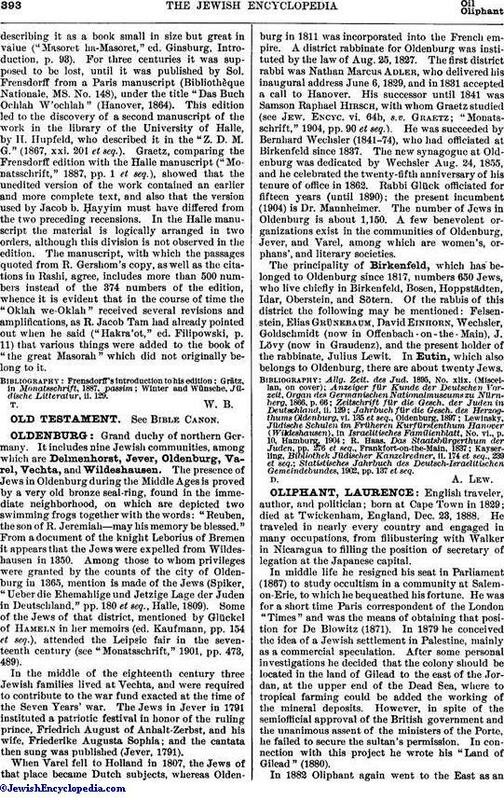 A district rabbinate for Oldenburg was instituted by the law of Aug. 25, 1827. The first district rabbi was Nathan Marcus Adler, who delivered his inaugural address June 6, 1829, and in 1831 accepted a call to Hanover. His successor until 1841 was Samson Raphael Hirsch, with whom Graetz studied (See Jew. Encyc. vi. 64b, s.v. Graetz; "Monatsschrift," 1904, pp. 90 et seq.). He was succeeded by Bernhard Wechsler (1841-74), who had officiated at Birkenfeld since 1837. The new synagogue at Oldenburg was dedicated by Wechsler Aug. 24, 1855, and he celebrated the twenty-fifth anniversary of his tenure of office in 1862. Rabbi Glück officiated for fifteen years (until 1890); the present incumbent (1904) is Dr. Mannheimer. The number of Jews in Oldenburg is about 1,150. A few benevolent organizations exist in the communities of Oldenburg, Jever, and Varel, among which are women's, orphans', and literary societies. The principality of Birkenfeld, which has belonged to Oldenburg since 1817, numbers 650 Jews, who live chiefly in Birkenfeld, Bosen, Hoppstädten, Idar, Oberstein, and Sötern. Of the rabbis of this district the following may be mentioned: Felsenstein, Elias Grünebaum, David Einhorn, Wechsler, Goldschmidt (now in Offenbach-on-the-Main), J. Lövy (now in Graudenz), and the present holder of the rabbinate, Julius Lewit. In Eutin, which also belongs to Oldenburg, there are about twenty Jews. Statistisches Jahrbuch des Deutsch-Israelitischen Gemeindebundes, 1902, pp. 137 et seq.